Originally from Orlando, Florida, Mike Muszynski received a Bachelor of Music, Bachelor of Engineering, and Masters of Music from Northwestern University, studying with Robert Barris, Lewis Kirk, and Christopher Millard. 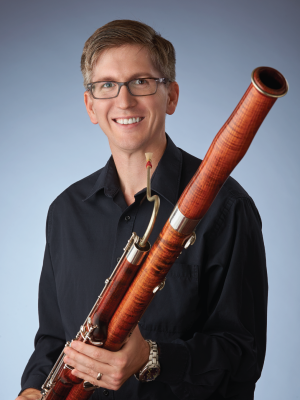 Before joining the Indianapolis Symphony Orchestra as Second Bassoonist in 2015, Mr. Muszynski previously served as Principal Bassoon in The Atlanta Opera, Atlanta Ballet, and Symphony Orchestra Augusta as well as Second Bassoon in the Greenville Symphony Orchestra and Columbus (GA) Symphony Orchestra. Additionally, he has performed regularly with the Atlanta Symphony Orchestra and the Charleston Symphony Orchestra. Mr. Muszynski has held teaching positions at Georgia State University and Butler University and has conducted masterclasses at Columbus (GA) State University and Indiana University. In his spare time, Mr. Muszynski enjoys photography, writing apps for the iPhone and iPad, and spending time with his wife and daughter.